Step 1) Pterodactyl panel uses a more secure protocol named SFTP, to access this you need an FTP client, we suggest FileZilla, which you can download here. 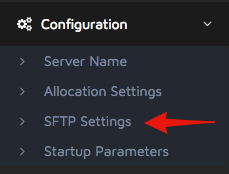 - Once you have downloaded and installed FileZilla or another SFTP client of your choice, you need to access your SFTP information from your panel. In your panel, select your server, and click on the configuration in the left sidebar which should let out a drop-down menu. In that menu click on ‘SFTP Settings’. Step 2) From there you should be able to find your SFTP information such as your username & your password. Step 3) You then need to open up FileZilla and copy in the address and username, the password is the password you use to login to the panel. Note: If you put in the correct details you should now be able to see the file system of your server. If you still can’t connect after being very careful to put in the right details, you can contact us via live chat on our site or our discord.